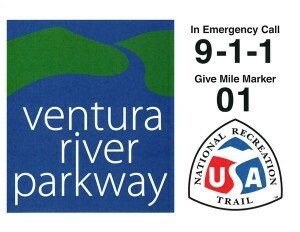 In June 2014 the Ventura River Parkway Trail was designated a National Recreation Trail (NRT). About 100 members of the public attended the dedication as well as many of our elected officials. This achievement was months in the making with the application and selection process. This designation is a significant recognition since slightly over 1,200 trails are so designated in the entire United States. NRT status should assist us in securing future grant funding as we expand and improve the Parkway. A Friends task force (including representatives from the City, County and conservation groups) will resume work in January to move the Ventura River Parkway Trail signage project forward. 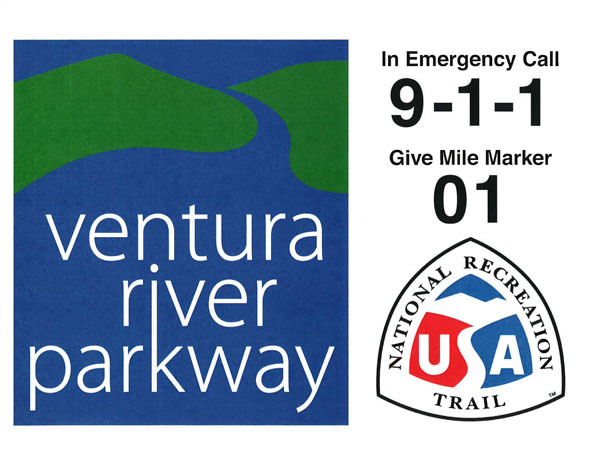 The signage includes 9-1-1 mile markers, the National Recreation Trail logo and the Ventura River Parkway logo. At this time it is contemplated that the signage will be affixed to the trail at quarter mile increments to aid users in gauging their progress and emergency responders in locating people in need of medical assistance. The English version is available at: City of Ventura Parks & Rec Department, Patagonia Retail Store, Real Cheap Sports, REI, The Mob Shop in Ojai, Open Air Bike Shop, Ventura Visitor’s Center, Ojai Visitor’s Center and a few other outdoor venues. Our local land conservancies (VHC and OVLC) also have a supply of maps. The Spanish language version is distributed on demand at community events. Friends again joined with the Ventura Hillsides Conservancy and other conservation organizations to host the Annual Picnic at the River in June. Friends also participated in Ventura Unified’s Summerfest, the City of Ventura’s first annual “Parking Day” and Patagonia’s Salmon Run. Friends continues to work with the West Ventura Community on access to the Parkway Trail to connect the Westside with the great recreational opportunities that it provides. It was a busy year for outreach. The Ventura Audubon Society will hold its Annual Christmas Bird Count on Saturday, January 3, 2015. The counts take place at various locations in Ventura County. To sign up to participate or learn more about count locations near you, contact Alexis Frangis at: alexisraehamilton@gmail.com or Frank DeMartino at frank@colynx.com. The Ojai Valley Land Conservancy (OVLC) acquired 2 new properties in 2014. One will add 24 acres to the Ventura River Preserve, expanding conservancy lands along the Ventura River Parkway. The land is along the floodplain and has excellent examples of a riparian scrub plant community. 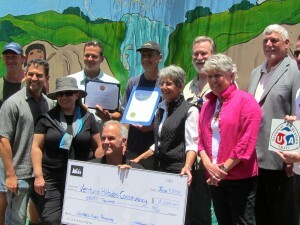 This project was made possible by a grant from the California Coastal Conservancy. The property may allow for a future trail route. A second property, consisting of 165 acres of wild lands in Senior Canyon, surrounded on three sides by The Los Padres National Forest, was purchased at a public auction. The property forms the watershed for Senior Canyon Creek, which is the water source for the Senior Canyon Mutual Water Company. The purchase was made possible by an anonymous donor to the OVLC and a consortium of water company members, and permanently protects this vital water source. It is being conserved as a natural area, so public trails are planned for this site. In addition to new acquisitions, the Ojai Valley Land Conservancy launched the 1% for Ojai program in 2014. The program is a partnership with local businesses to gather donations to support the acquisition and maintenance of publicly accessible open space and trails. Fifteen businesses have already signed on to help manage open space and trails. Throughout the Ojai Valley, the OVLC now owns and manages over 2,000 acres of publicly accessible open space. Responsible stewardship of these lands is critical to maintaining the quality of outdoor experiences enjoyed by preserve visitors. In recognition of the elevated focus on preserve management, the OVLC recently promoted preserve manager Rick Bisaccia to the role of Stewardship Director. Rick will oversee preserve management and develop projects to improve OVLC’s preserves. Find out about opportunities to volunteer with OVLC. The Ventura Hillsides Conservancy continues to work with State Parks and a crew of dedicated volunteers to clear illegal camps from State Parks land in the estuary. The recent rainfall blocked access to the island in the estuary which was the site of many camps and from which tons of waste have been removed via boat to transport it back to the mainland and EJ Harrison dumpsters. On December 20, VHC partnered with the Sea-Bees and Surfrider to focus on collecting the last few tons of trash from the estuary. The Conservancy is planning its Wild & Scenic Film Festival for March 13-14, 2015 and encourages attendees to purchase tickets early since both nights sold out for the 2014 event. To get involved in restoration & trail building opportunities on Conservancy preserves, contact Dashiell Dunkell at 805-643-8044 or ddunkell@venturahillsides.org. 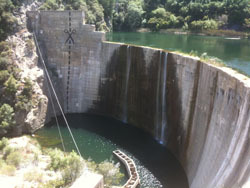 Measured progress is being made to develop a plan for removal of Matilija Dam. Studies are now underway to resolve the sediment management issues and reduce the cost of the project. The work is being performed by a combined consultant team from two firms, URS and Stillwater Sciences, both of whom have considerable experience with other major dam removal and river restoration projects in the western United States, including the removal of the dams on the Elwah River and the Condit Dam on the White Salmon River (both in Washington state)..
A report on the study group’s recommendations will be published in early 2015, and interim reports are downloadable at MatilijaDam.org. Stay tuned for more information in 2015. An update from the 2014 Salmonid Conference in Santa Barbara by Paul Jenkin (an approximately 20 minute video). The first half of the Ventura River Watershed Management Plan was provisionally approved by the Watershed Council at the November 20, 2014 meeting. Final approval will come when the entire plan is complete. The Table of Contents, Executive Summary, Part 1 – About this Plan, and Part 2 – Watershed Plan, Projects, and Programs, are now available in pdf format on the Council’s website, capping off two years of intensive work by Lorraine Walter, and her excellent skills at marshaling the assistance of the Ventura River Watershed Council. Read more about the SAVE MORE WATER campaign. 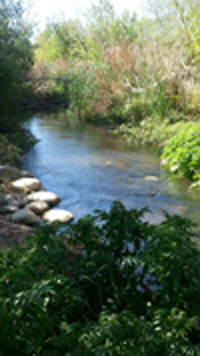 Read more about the Ventura River Watershed. Surfrider continues to promote its Ocean Friendly Gardens(OFG) initiative that was identified in a UCSB Bren School graduate thesis as one of the best strategies for water savings in the Ventura River Watershed. This strategy is especially important during our drought and in preparing for a future with less rainfall. The results are beautiful (we have incredible native plants), less water is used and more water is able to percolate during rainfall events. Read more about the OFG campaign. 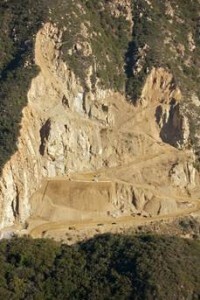 Santa Barbara Channelkeeper and the Environmental Defense Center (EDC) have entered into an agreement with the owner of the Ojai Quarry to settle the lawsuit filed last year alleging that stormwater management practices at the Quarry were violating requirements of the federal Clean Water Act and Endangered Species Act, resulting in polluted runoff that threatened water quality as well as the ability of steelhead to migrate upstream as a necessary part of their life cycle. Under the agreement, the Quarry has committed to implement a host of best management practices to reduce erosion and runoff and prevent blockages to migration of steelhead from the facility, which will reduce pollution and benefit water quality and fish habitat in North Fork Matilija Creek and the Ventura River. In addition, the Quarry has agreed to donate $60,000 of rock product to South Coast Habitat Restoration for steelhead passage projects in three local creeks. Check on SB Channelkeepers CALENDAR of events. Ventura County Watershed Protection District (WPD) has continued Arundo removal in both the Ventura River and San Antonio Creek. A 2014 Prop 84 grant for $896K was received by County WPD together with the Ojai Valley Land Conservancy which will complete Arundo removal in San Antonio Creek, making it the first watershed in the county to be cleared of Arundo. The MulitiChem facility was shuttered and cleaned-up pursuant to a County enforcement action with Environmental Protection Agency (EPA) oversight. Through the combined enforcement efforts of the US EPA and Ventura County, the Multichem facility has had soil contamination and most hazardous material clean-up completed, and the petroleum storage tanks and numerous small buildings and pieces of equipment have been removed. The County and property owner are working on a schedule for removal of remaining equipment. The San Antonio Creek Spreading Grounds project was completed by the Ventura County WPD which will allow additional stormwater capture and infiltration in a manner that does not compromise downstream habitat values. Biofiltration Project – Ventura County received grant funding in the amount of $1 million for a large-scale storm water biofiltration project in the Meiners Oaks area to be completed in conjunction with the Ojai Valley Land Conservancy. It also includes a community outreach-education program on Ocean Friendly Gardens (OFG) in conjunction with the Ventura Chapter of Surfrider. Southern Steelhead – The first Southern Steelhead Restoration conference was held in Ventura, with field trips led by knowledgable conservationists for participants and elected officials to locations of interest in the Ventura River Watershed. Friends of the Ventura River is a coalition of community groups and individuals who recognize the need for the protection and enhancement of the Ventura River watershed to improve our quality of life and ensure our future sustainability. We invite you to visit our website at friendsofventurariver.org – this is a place for friends to post their ideas, concerns, and activities and provide for a community forum about the river in our backyard. Please contact Paul (pjenkin@surfrider.org) or Diane (dunderhill@sbcglobal.net) to find out how you or your organization can get involved! The Ventura River Parkway Trail combines the Ventura River Trail with the Ojai Valley Trail giving bikers and hikers a great 16.5-mile trail connecting the estuary in Ventura to the Los Padres National Forest above Ojai. Patrick Johnston from the National Parks Service (our hero from the recent Friends of the Ventura River NPS -Rivers and Trails Conservation Assistance grant and mastermind behind our fabulous foldout Ventura River Parkway Trail Guide –Thank you Patrick!) read a letter from his boss, US Interior Secretary Sally Jewell officially designating the trail as a National Recreation Trail. Over a hundred people attended the celebration event at VHC’s Big Rock Preserve including members of Girl Scout Troop 60718 who helped tidy up the area before the dedication event. Their presence reminded all of the adults in attendance why we need to work so hard to preserve these natural areas and trails for future generations. At one point in her talk Hannah-Beth stated that “it takes a village” to move projects like these along. And I would like to note that without help from these elected officials and public servants at critical junctures along the way, it would be difficult for the Friends of Ventura River coalition to have accomplished so much in such a relatively short time. I say relatively short, but that might not be correct. In talking with Mark Capelli, the original “Friend of the Ventura River” (We couldn’t afford the “s” he quipped.) and listening to he and Kathy Bremer (who had worked at Patagonia when “Friends” first began and is now a City Parks and Recreation commissioner) reminisce about events 30 years ago, it hammered home to me that it indeed has been a long haul. “Presented to the Friends of the Ventura River in recognition of your dedication and commitment to our community, and protecting our valuable natural resources; and upon receiving A National Recreational Trail Designation for the Ventura River Parkway.” Signed by Senator Hannah-Beth Jackson. So congratulations FoVR, with a special shout out to our Ventura City Parks Department and Ventura County Parks Department and to our own Kathy Bremer for aiding the application through the process and to all of those elected officials and public servants and FoVR groups who wrote letters of support. JOB WELL DONE! So, it was, as Julia Brownley so aptly pointed out, “like every day in Ventura County, its a perfect day…” and everyone celebrated the NRT recognition and left with lifted spirits and incentive to expand and re-double our efforts to restore and enhance the Ventura River and its parkway trail. The NRT recognition will help all of our FoVR groups in their efforts on behalf of the river, its ecosystems and the parkway. Thanks everyone for staying involved!